If you love a good salad but want something new and different, try serving this Charred Romaine with Green Goddess Dressing. The slight wilting of the romaine lettuce and charred leaves give it a nice, smoky, and intense flavor. 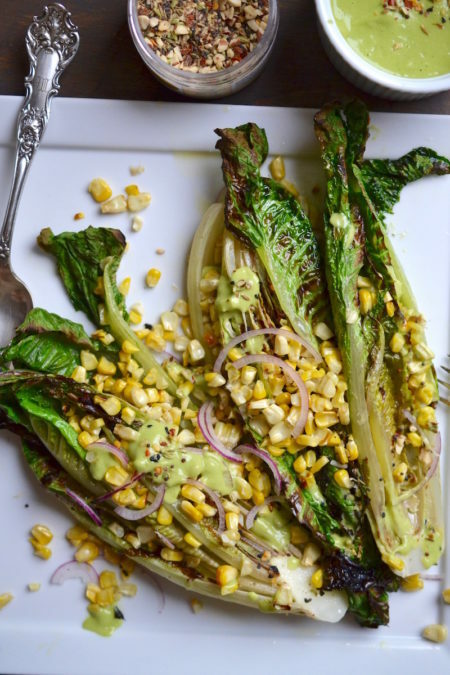 This salad is garnished with fresh toasted corn and a creamy, herb flavored Green Goddess dressing with hints of Indian spices from our Glory Kitchen Mumbai nut & spice mix. Sprinkled on the lettuce before it goes under the broiler, the nuts & spices intensify in flavor. Sprinkled on top just before serving, they add a nice crunch and a pop of heat and flavor. 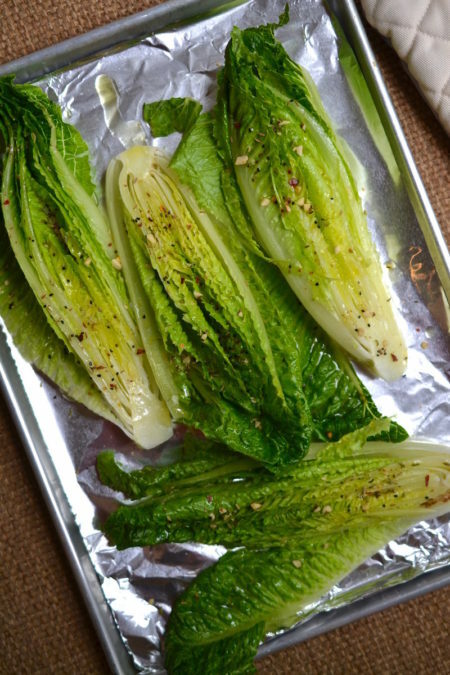 Trendy restaurants have recently popularized grilled romaine lettuce salads, however, here I’ve bypassed the grill and placed it under a hot broiler for just a few minutes to char the delicate edges and give the firm romaine just a bit of a wilt. I prefer to place it under the broiler as opposed to throwing it on the grill because by doing so it is a bit more simple, and, the less it needs to be handled the better it will keep its shape. Once it is browned, I quickly remove it from the oven, allow it to slightly cool, and serve the salad right away topped with corn and some crunchy nut flavor from our nut blends. Any leftover Green Goddess dressing can be used for raw veggie dipping, a sauce drizzled over fish, or a spread on a sandwich. The bright green color from the avocado and fresh herbs is pretty and the flavor is so fresh and creamy. Experiment with this recipe and toss it with any of our other Glory Kitchen nut blends if you wish to move it in another flavor direction. Enjoy! In a blender, mix together avocado, garlic, vinegar, lemon juice, honey, anchovy, herbs, water, salt & pepper until smooth. If you are not a fan of anchovies, you can certainly leave these out but I think they add a great salty flavor to the dressing. Slowly add in the olive oil until it is smooth. If it is too thick, add a bit more water (1 tablespoon at a time) until the right consistency is achieved for a creamy dressing. Taste and season with more salt and pepper if needed. Toss the chopped red onion into the blended dressing and stir in with a spoon. Set the dressing aside and allow to sit at room temperature while the salad is being prepared. Set the oven to broil and place the oven rack on the upper third of the oven. Not the very top, but close. Clean the ears of corn and place them on a foil lined baking sheet. Drizzle with a bit of olive oil and a sprinkle them with a bit of sea salt. Place them in the oven, under the broiler, and allow them to brown a bit (but not burn). Using tongs, turn them a bit so all sides get a bit toasted. If they are put into a hot oven, this process should only take a few minutes so stay close to the oven. Remove from the oven and allow to cool completely. Using a large knife, cut the kernels off each ear. Place the toasted corn in a bowl. Leaving the cores intact, and using a large chef's knife, slice each head of romaine lettuce in half lengthwise. Place them cut side up on a foil lined baking sheet and drizzle each one with olive oil. Sprinkle with a bit of sea salt and some Mumbai nut & spice mix. Place in the oven, under the broiler and keep a close eye to make certain they do not burn. When the edges are charred and just a bit wilted, remove from the oven and let them cool. Arrange the charred romaine on a serving platter or on individual serving plates. Sprinkle the toasted corn across the lettuce heads. Top with very thin slices of red onion and then drizzle with the Green Goddess dressing. Top them with a sprinkle of Mumbai nut & spice mix and enjoy! These charred romaine leaves would be wonderful with any of the other Glory Kitchen blends. If you choose to try the Provence blend, I would add a few sprinkles of currants or raisins over the whole dish which would add a nice sweetness to the salad.